Merino, shetland and corrediale wool + pure silk, sillk blends, hand dyed and hand spun bamboo yarn. 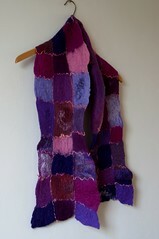 A lovely light and warm scarf for this winter. Click on the photo for a larger view and details!